A while back I sat with a young man (22) as he considered hiring me as his coach. Listening to him, I evaluated every word he shared. I must admit this was a little different than what I am used to (because typically I coach married women and men). As I stared at his young features, without spot or wrinkle, I realized age is a matter of perspective. Equally shocking are the thoughts of young people (by society’s standards of age) that declare “they are too young” to do anything of value. Our ways of thinking about how old or how young we are express an attitude about age that will hinder our current state of being. In both ways of thinking, we are limiting ourselves to what God can do with our life. 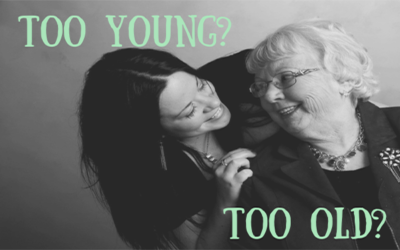 Ultimately, I think people choose to use age as an excuse to not accomplish their purpose in this world. I AM TOO OLD will define there are no more opportunities in your life and that all opportunities passed you by. Real Life Example Proves Otherwise: Ray Kroc, the founder of McDonald’s, was 52 when he was a milkshake machine salesman and just six years later he was the owner of over 200 McDonald franchises in the U.S.. Kroc obviously kept an eye open for opportunities and did not let his age define his success or endeavors. I don’t know about you, but this is super exciting to me! I get fired up just thinking about what anybody can do when they choose to do it. No matter what age, we have great things going for us. Take advantage of your age, wherever you are, and tell yourself a different story that appreciates your age NOW!